The former head of Verizon is talking. Can you afford not to hear what he has to say? "This is an essential read for every manager's, or aspiring manager's, success for one simple reason: it is all authentic and it works." --Ivan G.
Seidenberg, CEO, Verizon (from the Foreword)"Even though Denny was a fierce competitor, I couldn't help but admire him for his strong track record of performance, his no-nonsense approach, and his honesty and integrity." 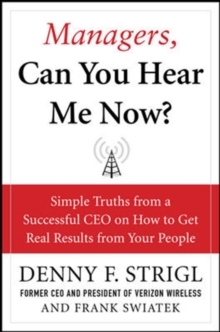 --Dan Hesse, CEO, Sprint Nextel"Denny Strigl is one of the most consummate competitors I have ever known! That's saying a lot considering the 14 years I played in the National Football League. I have been a front-row observer of his business acumen at Verizon for the past 7 years as the president and CEO of CTIA. The Wireless Association. In this book, in typical Strigl manner, Denny pulls no punches! Managers, Can You Hear Me Now? is a straightforward and honest look at priorities and decision making in today's fast-paced world as told by not just a survivor but a success in this competitive world." --Steve Largent, President and CEO of CTIA-The Wireless Association, former U.S. Congressman, and former NFL player"A must-read for managers at every level in companies large and small. 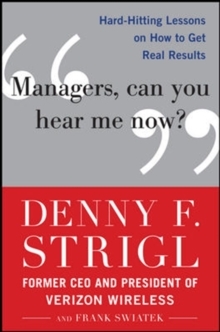 A road map for management success written in quintessential Denny Strigl style--clear, concise, and direct." --James E.
Rohr, Chairman and CEO, PNC Financial Services Group"This book brims with refreshing candor and common sense about what it takes to become a manager who delivers results." --Antonio M.
Perez, Chairman and CEO, Eastman Kodak Company"A must read for business leaders and managers in today's global competitive marketplace where teamwork and decision making is so critical to success." --William G.
Parrett, former CEO, DeloitteAbout the Book:"The foundation of our managers' philosophy relies on one main, undeniable point: a manager's number-one priority is to deliver results." --Denny F.
StriglAre you delivering?For managers, behavior is the real key to achievement. In order to stop struggling and start delivering, you need to close the gap between what you know and what you do. That's been Denny Strigl's method, and now it can be yours, too. Among the most prominent architects of the wireless communications industry, the former Verizon Wireless president and CEO has had one of the most remarkable careers in modern business. In Managers, Can You Hear Me Now?, Strigl shares all the skills and techniques he used to build Verizon into one of the greatest growth companies in any industry. You'll learn how to:Create a corporate culture where trust, respect, and integrity flourish- and employees and customers alike are appropriately served"Eliminate the fluff," get focused, and stop wasting time on things that don't matterAddress issues proactively before they become problems--even employee performance issuesGet past your "blind spots," reinforce priorities consistently, and communicate with clarityMaster the Four Fundamentals of Management: growing revenue, getting new customers, keeping the customers you already have, and eliminating costsManagers, Can You Hear Me Now? includes additional suggestions for bringing the best of your energy and passion into your work, helpful anedcotes from Strigl's career, simple self-assessment questions, and even a look at how your business day as a successful manager should play out. Whether you're the CEO of a large corporation or run your own small business, the lessons from Managers, Can You Hear Me Now? are sure to come through--loud and clear.